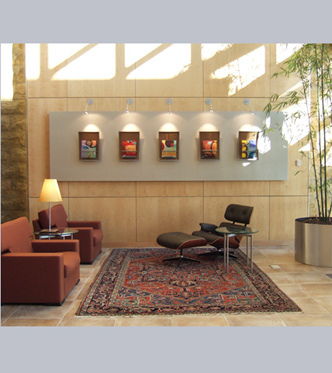 The Art Company partners with interior designers and architects to find art which will enhance every project. A national leader in healthcare, WellPoint, based in Indianapolis, acquired a former airport hanger with the intention of transforming it into unique office space. 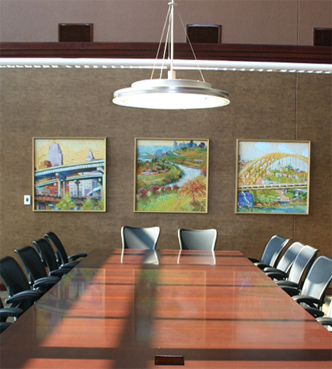 In collaboration with Dollries Design Consultants, The Art Company took this opportunity to showcase the talents of several Indiana artists whose creations now humanize this interesting space. Total Quality Logistics (TQL) is a contemporary, four-story building prominently located on the Eastern I-275 corridor of Cincinnati. A face-paced company that brokers shipping services nationwide, TQL asked The Art Company to work with design firm Design Details to select artwork that creates a brand image. The Reynolds & Reynolds Company, based in Kettering, Ohio, provides IT solutions to the automotive industry. 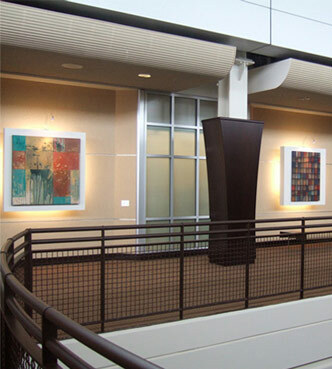 When The Art Company was hired to finish the contemporary design at Reynolds’ & Reynolds corporate headquarters, The Art Company located a wide variety of unique artwork all built around an automotive theme. From restored gas pumps, banners of classic cars and chairs made from recycled road signs to framed photos of model cars, the result is sophisticated and surprising.